"This is an album recommended for die-hard fans of the band"
"They Might Be Giants will release their new album, 'Phone Power', on June 10 via Lojinx. " "The only artist who releases music at a freakier clip than They Might Be Giants is Future, though Brooklyn’s finest don’t need any performance-enhancing cocktails"
"Like Radiohead before them, They Might Be Giants — bear with me — is letting its fans pay whatever they want for the band's new album. " "It’s their ability to draw so widely, not only in terms of references and topics, but musical styles, and to do so with unstinting irreverence, which makes ‘Why?’ a source of pleasure." "THEY MIGHT BE GIANTS TOUR – THE HARDEST WORKING BAND OF 2015?" 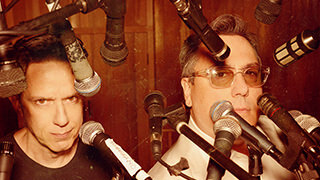 "A Buyer's Guide To They Might Be Giants"
"There's some weird stuff in this hopper, people." "Glean sounds as fresh as an album from a band that’s just getting started"
"They Might Be Giants’ 17th album couples the band’s usual quirks with an abundance of stylistic influences"